Writing. Life in Colorado. Other good stuff. The only female of the Eight Taoist Immortals, Ho Hsien-Ku is also known as the Health Goddess. At the age of fourteen or fifteen, when she was living in the mountains, she had a dream that a god told her to eat powdered mica so as to attain great agility and immortality. (In one account, she lived on mother-of-pearl and moonbeams.) She soon realized that she didn't need to eat ordinary food to survive. 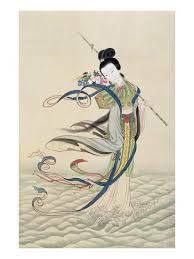 Before too long, she "disappeared from view" and became one of the eight immortals. Okay, hold on a second here. I'm no feminist scholar or anything, but a teenage girl who eats ground up rocks instead of food and thereafter "disappears" sounds a lot like someone with an eating disorder. And the fact that this is somehow held up as an ideal of femininity--so much so that she became the only female among the immortals--well, I must respectfully disagree. On a positive note, Ho Hsien-Ku is revered as a healing influence for both physical and emotional wounds. She is often depicted carrying the lotus flower of caring or the peach of immortality in her hands and is associated with the qualities of trust and open-heartedness. 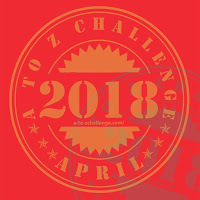 Happy Monday, and have fun with week two of A to Z! I have to agree. Did anyone consider that she ate rocks and died because of it and that's why she disappeared? Maybe she fell into a lake and all that rock weighed her down. Obviously the way it's told in legend sounds much nicer. I didn't even think about falling into a lake! Interesting. I've never heard of her before--thank you! I hadn't heard of her before this week either. Thanks for commenting! I'm ashamed to admit that I probably wouldn't have thought anything of this story - other than admiring the feasting on mica or moonbeans idea- if you hadn't written what you did about the problem with this myth. Good point, Jenny. Great qualities to be associated with. Thank you for a story previously unfamiliar, an enjoyable read. Thanks for stopping by, Silvia! Writer, reader, wife, mother, late bloomer. 80% decaffeinated. My feet are always cold.